Nope! But gosh, that's a cute screenshot. Those must be some pretty tight socks, considering his enormous her feet usually are. I'll throw a guess out there... Steve? And Steve it is! Somehow I knew one Loremaster or another would snag this one soon, given the fact that I allowed for a brief glimpse of his relatively unique hair. Okay, we're winding down to the final three rounds. Will PrettyCoolStairs defend his title, or will Jekyll Jekyll Hyde emerge triumphant? OR...will I get creative with the rules and throw everything into a tangle at the last minute? Who is Steve? I believe he's a fourth grader at Lakewood. He's had a minor speaking role here or there. Hmm...I'm afraid I'm going to need some help here. Apparently it's Russian. i will guess we are looking at Maria or at least the upward end of her. Nope, not Maria. 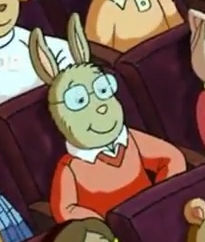 Not Buster either, assuming that was the intended guess. Is it Jessica, by any chance? Nope! But I will admit, the ears look exactly like her ears in that shot. Getting closer, though. It is Madison Compson then? Nope, not Madison. I would like to see more of her in the near future, though. Maybe another obscure character, like Vance Legstrong (Lance Armstrong)? Nope, not quite that obscure (though I wouldn't put it past myself). They're relatively familiar. 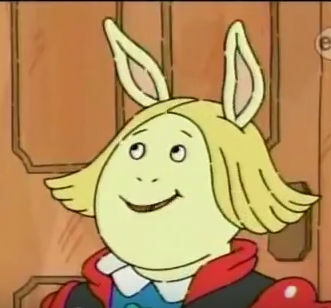 Nupe, not Ms. Sweetwater...but I'd take her over Mr. Ratburn any day. Speaking of whom, why don't we have an emoticon of her yet? Oh right, because I haven't made one yet. Wow, Mike. How did that happen?